This weekend Vera Bradley is offering Up to 50% off Summer Patterns. Plus, score FREE Shipping on ALL orders! 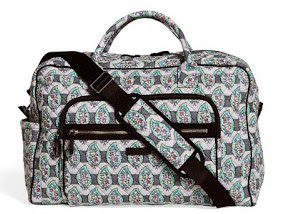 I LOVE this Iconic Weekender Travel Bag priced at ONLY $59 (Retail $118). Don't forget to Subscribe to the free newsletter and check out My Chicago Mommy's Coupon Database to search for coupons! Links provided may be from affiliate programs which help support this blog. Thanks for clicking!